A rare 1962 Ferrari 268 SP by Fantuzzi will be one of the top racing cars on offer at the 2016 RM Sotheby’s Monterey classic car auction. This car was an important factory development car and raced in period. It was part of the Pierre Bardinon Mas du Clos Collection for nearly three decades. A 1962 Ferrari 268 SP by Fantuzzi, chassis 0798, will be one of the leading Ferrari’s with an important racing history on offer at the RM Sotheby’s Monterey classic car auctions on August 19-20, 2016 in California. 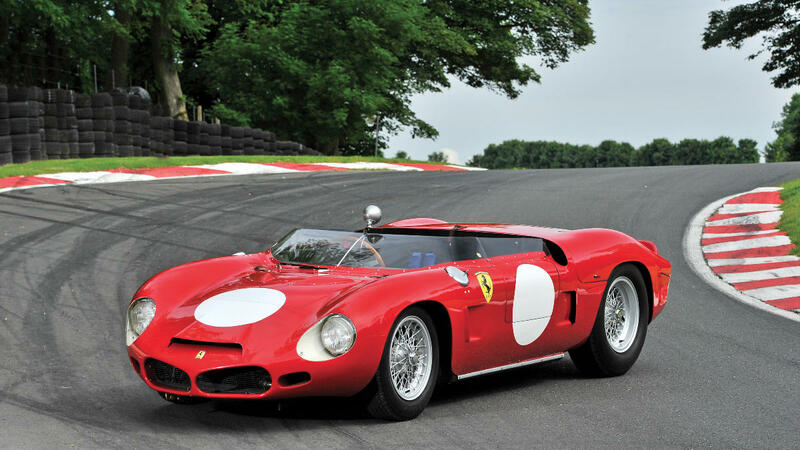 An exceptional matching-numbers car, it comes to auction with the all-important Ferrari Classiche certification. No estimate has yet been released. Chassis no. 0798 claims extreme rarity in the Ferrari lineage; it is the third of just six 268 SP examples originally produced, of which only five remain, and one of only two originally fitted with the outstanding 2.6-liter eight-cylinder engine. It is further differentiated from its peers by its unique shark nose along with its cut down windscreen and lowered tail, which make for a sleek profile. This Ferrari 268 SP was integral to Ferrari’s testing at Le Mans in 1962, being the factory racing and development car and subsequent Works entry at the 24 Hours of Le Mans that same year. It was later sold to North American Racing Team (NART) owner, Luigi Chinetti, who campaigned it under the NART banner from late–1962 through 1963, including at such events as Bahamas Speed Week, Sebring and the Canadian Grand Prix. After passing through the hands of various noted collectors, 0798 eventually found its way into Pierre Bardinon’s esteemed Mas du Clos Collection in 1969, where it remained for the next 27 years. Its current gentleman owner has fastidiously maintained the car for nearly two decades, during which time it has been displayed at select major events around the world, including the Goodwood Festival of Speed, Ferrari Days at Spa-Francorchamps, the Cavallino Classic and the Ferrari 60th Anniversary Concours. “The Ferrari 268 SP is a groundbreaking automobile in every regard,” states Gord Duff, Car Specialist, RM Sotheby’s. “Not only was it rare to start with, but only five examples remain in existence. Its dramatic Fantuzzi spider coachwork represented a complete departure from prior Maranello coachwork and included design cues that became instrumental to seminal Ferrari racers such as the 250 P and 330 P, and even influenced Scaglietti-built berlinettas such as the 250 LM. All this, combined with an exceptional provenance, make it one of the finest and most desirable 1960s Ferrari sports-racers to be offered in many years.